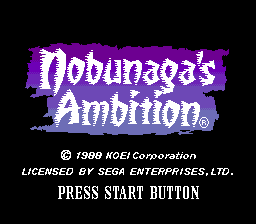 Nobunaga's Ambition, known as Nobunaga no Yabou: Zenkoku Ban (信長の野望 全国版) in Japan, is a Sega Mega Drive and strategy game by Koei. It is compatible with the Sega Mouse. Main article: Nobunaga's Ambition/Magazine articles. NEC Retro has more information related to Nobunaga no Yabou: Zenkoku Ban.